IMMACULATE! No expense was spared on this beautiful three bedroom, one and a half bath, designer remodel. The UPGRADES include: Porcelain tile floors, new cabinets and vanities throughout, butcher-block countertops, recessed lighting, all new appliances, a gorgeous tiled walk in shower with glass panel enclosure, all new energy efficient windows and doors throughout.... and the list goes on. Every detail in this adorable home (that lives larger than its listed square footage) is stylish and inviting. This home is perfect for living an indoor-outdoor lifestyle with beautiful mountain views from both the front and back yard as well as your own private pool. 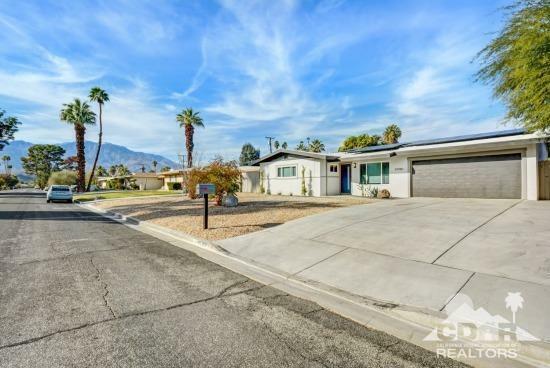 This home sits on FEE land, in a little known pocket neighborhood bordering Rancho Mirage. This area has great upside potential for appreciation and there are no HOA's.